It’s time to chill some bottles and get your flutes ready. 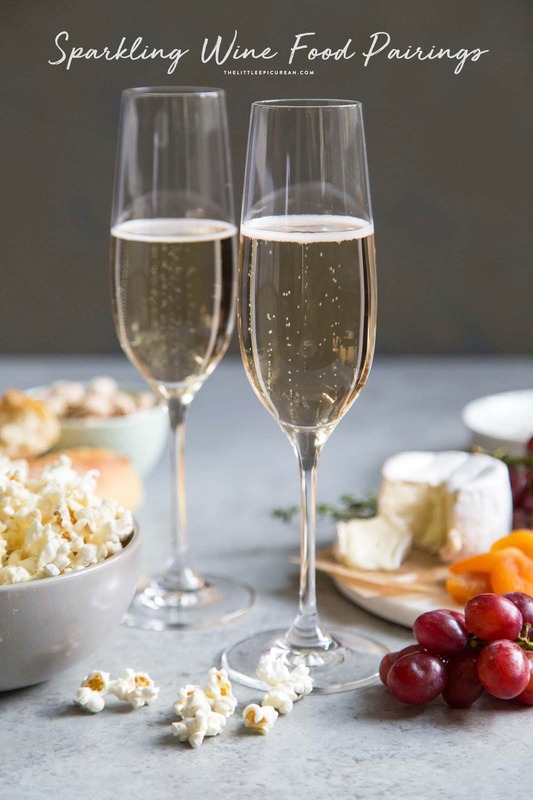 Whether you’re entertaining guests, celebrating special occasions, or simply relaxing at home with loved ones, sparkling wine is always a good idea. Born and raised in California, of course I’m partial to California sparkling wines. 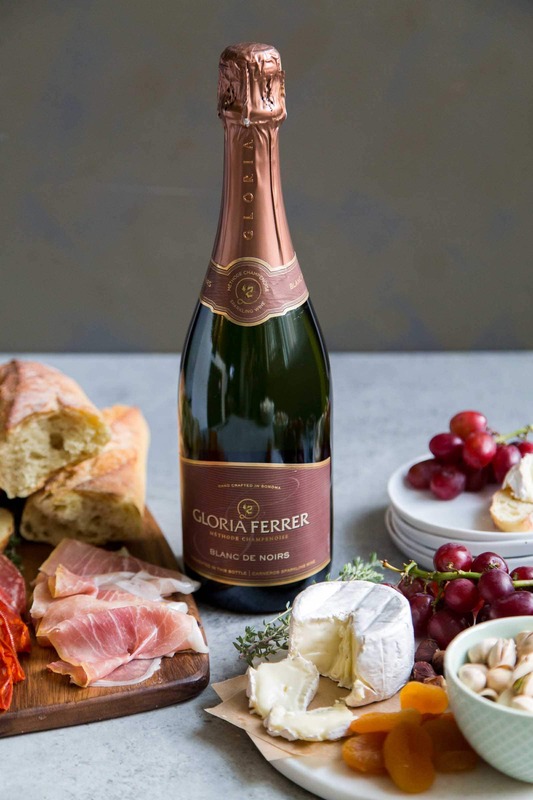 Gloria Ferrer is handcrafted in Sonoma and is California’s most awarded sparkling wine house. Over the last five years, Gloria Ferrer has received over 500 gold medals and 50 90+ ratings. If those stats mean nothing to you, let’s talk about taste and quality. 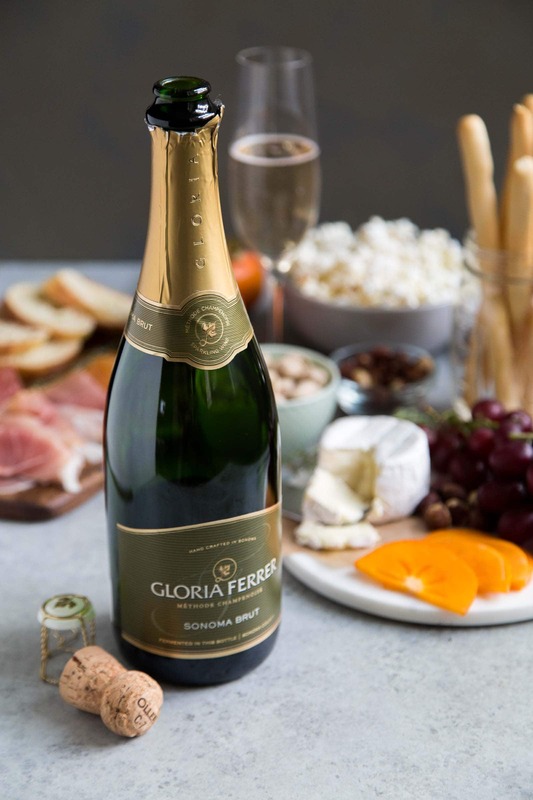 The sparkling wines of Gloria Ferrer are the perfect match for a variety of different occasions and festivities- from a bridal shower for 20 to date night on the couch for two with take out from your favorite Thai restaurant- there’s a sparkling wine for that. Today we’re focusing of two: the Sonoma Brut and the Blanc de Noirs. Both sparkling wines are composed of Pinot Noir and Chardonnay. Both are fruit forward in aroma and very pleasing to the palate. 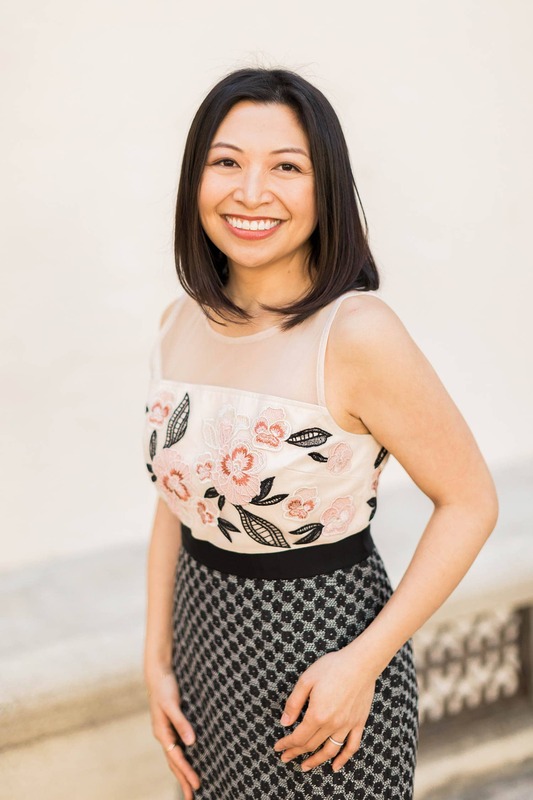 Now, let’s talk sparkling wine food pairing! The Sonoma Brut smells floral and lightly sweet. It’s a bit citrusy in flavor and it’s a super versatile wine that pairs with every day foods. It’s terrific with seafood (think shellfish, crab, fish). The Sonoma Brut brings out the same qualities that a squeeze of lemon can do to liven seafoods. Since I’m more for a cheese and charcuterie kind of lady, I’ve paired this sparkling wine with triple creme brie and fresh grapes. 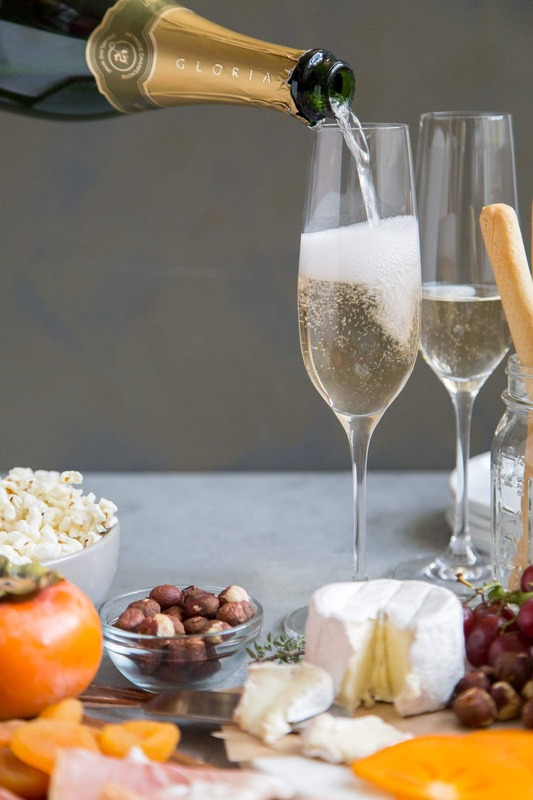 The creamy, silky cheese with the sweet grapes works wonderfully with the bright Sonoma Brut. As for charcuterie- you honestly can’t go wrong, however, if you happen to find Finocchiona salami, GET IT! The fennel used in that salami is heavenly with this sparkling wine. The Blanc de Noirs lends to a fruitier aroma, predominantly strawberries and black berries. 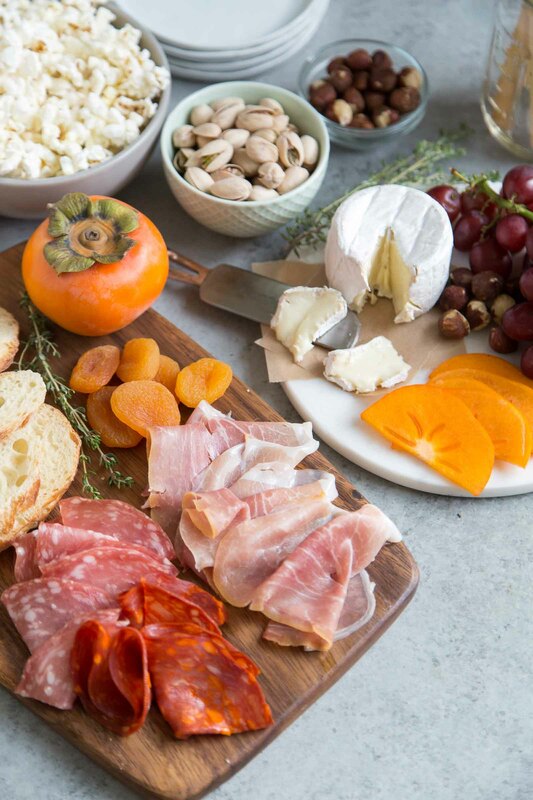 It pairs well with hard aged cheeses– think aged Gouda or Parmesan. The saltiness (and often nuttiness) of these hard aged cheeses is balanced with the lively, creamy Blanc de Noirs. I like to pair this with buttered popcorn tossed with grated parmesan. It’s definitely one my favorite movie night snacks. It’s also lovely with sweet fruits like persimmons and dried apricots. Remember when I mentioned take out? This sparkling wine is perfect for Thai food. The sweet, salty, spicy qualities of Thai food mesh magically with this bright and crisp sparkling wine.